I’ve written before about how frustrated I sometimes get looking for nice clothes for my Barbies. Well poor old Ken has an even worse time. I have a few Ken’s in my collection. My sister has a lot and she often complains of how hard it is to dress them the way she wants them to look. Like me, she generally resorts to buying outfits from de-boxed dolls and eBay sellers who create clothes for Ken. 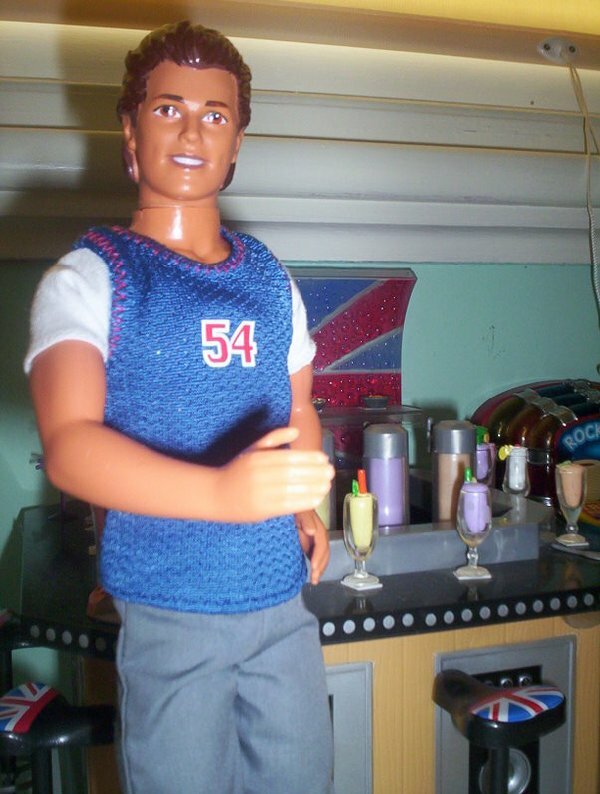 I find it very odd that Mattel makes so few outfits for Ken. He is often jokingly referred to as one of Barbie’s accessories but he really can’t keep up with her in the way of fashions and accessories. Not only are there very few outfits released for him but our fussy Ken dolls would not be seen dead in more than half of them. Most of the playline Ken outfits that are released are either tuxedos or beach wear. There isn’t much in between and some of the combinations that have been released in the past are truly bizarre. I am thinking of one particular from some years ago now which paired check shorts with a striped shirt and tie. A lot of playline Ken’s tend to be either Bridegrooms or Princes and lately the princes have been coming with painted on “tights” instead of real ones. There is also the extremely annoying habit they have of making “all in one” outfits which may make them look less bulky but I always feel so cheated when I take Ken’s jacket off to discover a sleeveless shirt attached to his pants! 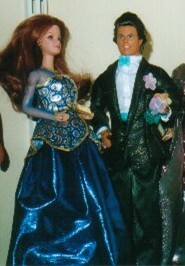 Playline Ken’s often come dressed as Princes-Mattel advertising photo. Can you imagine the conversations in the Dreamhouse as Barbie and Ken get ready to go out for a casual dinner or a movie? “You are not going out like that are you?” “But Barbie I like my board shorts.” And really IMHO the only place that a pink suit jacket should be worn during the day is to Jane McGrath Day at the SCG! It wasn’t always that way. 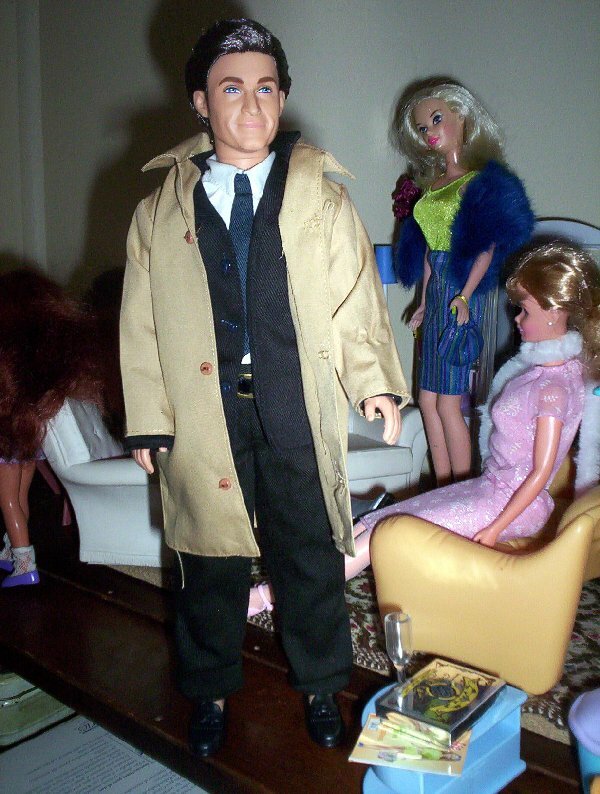 I have an old Barbie booklet from the 1960s and in it Ken has a suitable outfit to accompany Barbie to any event. Why did Mattel stop doing that? Don’t children who have Ken want to dress him up too? I expect that if they did start making matching outfits they would be way too cute for my taste but children would enjoy them and we adult collectors would have a bit more to work with at least. Occasionally a playline doll will come out with a decent outfit. The Basics line at least had clothing that could be mixed and matched and Ken shoes have certainly improved over the years but by and large he remains a dag except when in evening dress.Unfortunately from my point of view the evening dress is often spoiled by silly pink accessories. 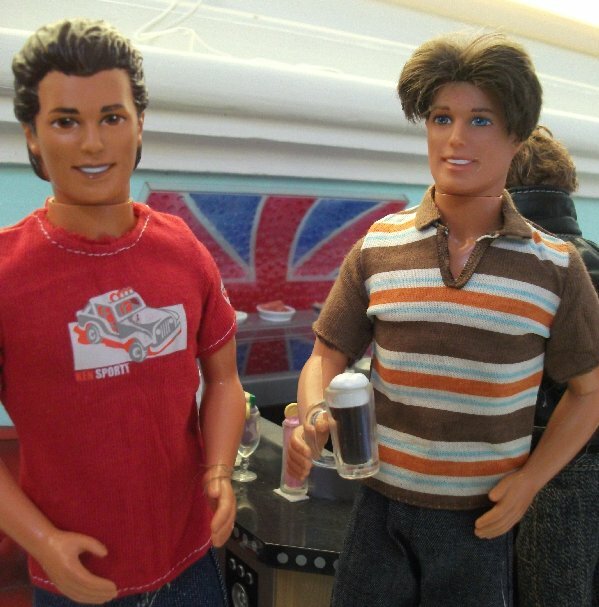 Kens often come in evening dress. Given that the current Barbie playline fashions are not great I don’t expect this situation to change very much. After all my sister and I have been complaining about it since the late 90s. 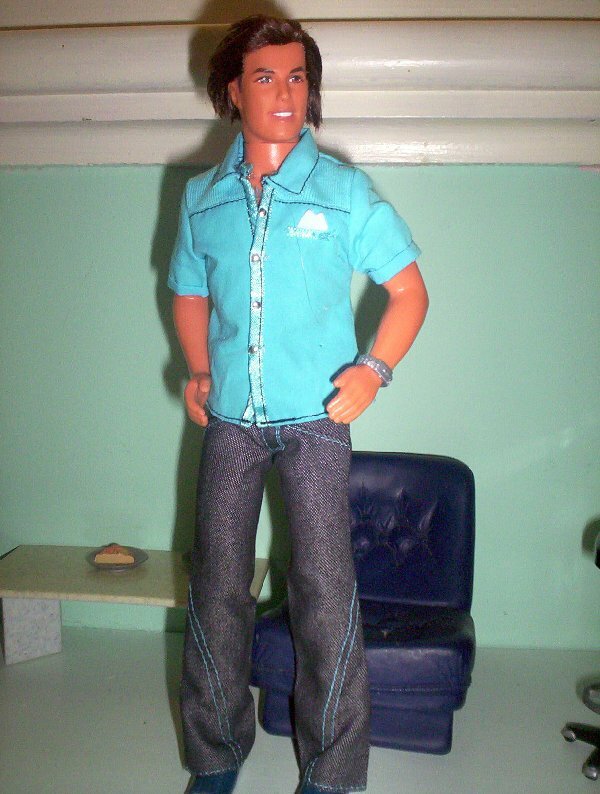 I remember that around that time Mattel released an outfit for Ken which featured blue jeans and a leather jacket. I think we bought about four of them. Occasionally they turn up on eBay today and boy have they shot up in price! If you would like to see some more examples of Ken fashions a great place to do it is the “Keeping Ken” website which has pictures and descriptions of Ken fashions from the past 50 years. Except where credited the photos in this post are mine and the Ken’s are from my own collection. This outfit, modelled by Mark, came with a Fashion Fever Closet and is one of the more acceptable ones in my view. 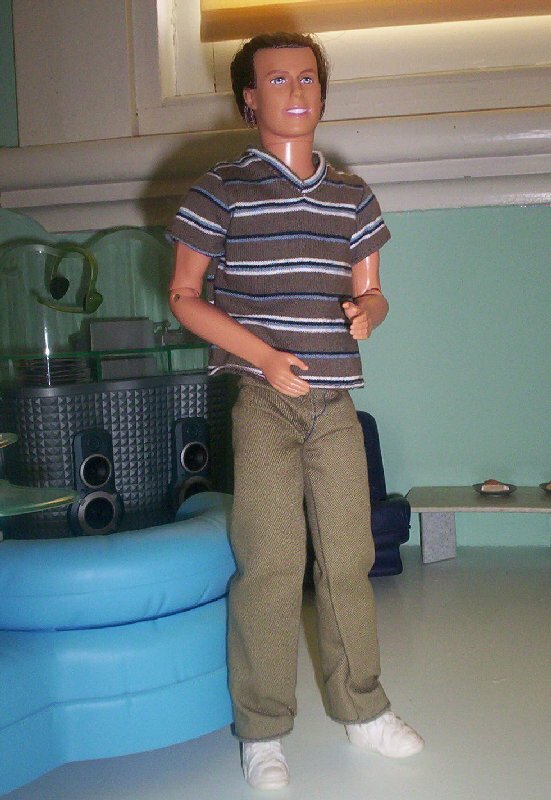 The Fashion Avenue Line is probably the best bet for Ken Fashions, there are very few that I didn’t like and if you have every Ken outfit – it’s about 70 outfits in total. But also de-boxed My Scene “Blaine” fashions are worthwhile sometimes, I despair at the Fashion Fever range which has about 10 fashions for Ken – and most of those are for the smaller dolls. I agree the Fashion Fever male fashions were pretty useless. There were some nice Fashion Avenue ones but compared to the original Ken fashions which matched Barbie there is not much variety.